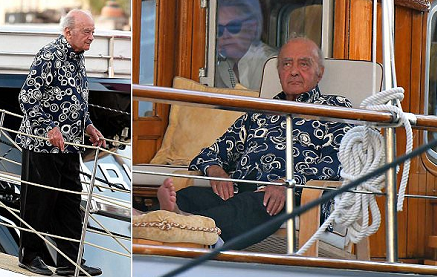 Mohamed Al-Fayed has been pictured on his luxury yacht in St Tropez as he prepares to mark the 20th anniversary of his son's death. The 88-year-old looked deep in thought as he relaxed on the deck of Sakara, his 112ft-long boat. It comes as the former Harrods owner looks set to mark 20 years since Dodi Fayed and Princess Diana were killed in a car accident in Paris. Al-Fayed has said he still mourns the death of his son twenty years after they died and claims they were killed because they planned to marry. He claims to spend 300 days a year sitting beside his son's body, which has been interred at a mausoleum in the grounds of his mansion near Oxted in Surrey. before the pair died in a car crash, untouched as a shrine to his son. The billionaire believes they were killed by security services on the order of Prince Philip to prevent her from marrying a Muslim, even though he has no evidence. One month after the claims were made by Mr Fayed in 2000, Harrods was stripped of its 44-year-old royal warrant, which was granted by the Duke of Edinburgh. A spokesperson at Buckingham Palace said at the time it was due to a 'significant decline in the trading relationship' and refused to comment on the matter further. Another source told the paper: 'Mohamed remains confident that information will emerge confirming his belief that Dodi and Diana were deliberately killed by the security services. Despite his claims of a murder plot, an inquest held into the deaths of Dodi and Diana ruled the pair died because of the 'grossly negligent' driving of Henri Paul and the paparazzi in pursuit of their car. Jurors blamed the 'unlawful killing' on driver Henri Paul and the group of paparazzi photographers who were following his Mercedes. Like the earlier French and British police investigations, the panel concluded Mr Paul had been drinking and was speeding when the car hit a pillar in the Alma underpass in Paris in August 1997. They also singled out the paparazzi's speed and the way they were driving as contributory factors, but concluded the couple could have survived the accident had they been wearing seatbelts.